Once it has been decided in the planning process that competitive sealed bidding is the appropriate method, the process below shall be followed. 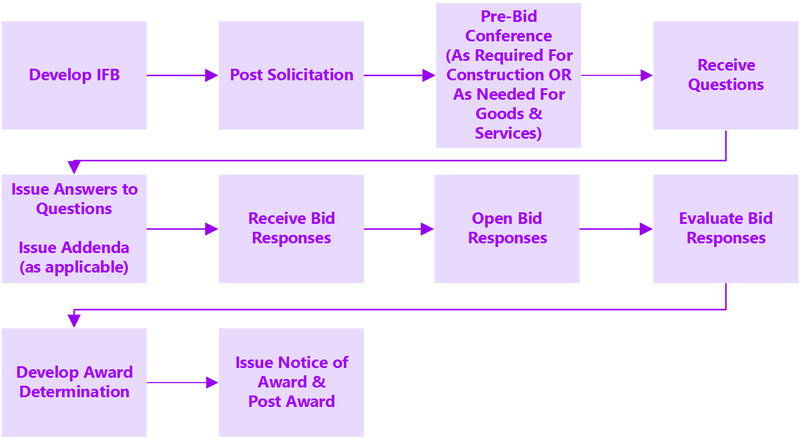 The Competitive Sealed Bidding process is outlined in the graphic below, and detailed in the following sections. Any other special information, such as any requirement of intention to bid, if required, or the time, date, and location of the pre-bid conference. Agencies are encouraged to incorporate these elements and any other agency-specific requirements into a checklist to ensure compliance with all requirements prior to releasing the IFB. The IFB document may require internal agency reviews and approvals prior to posting the Public Notice or releasing the IFB on an eProcurement system. Other appropriate information (e.g., the time, date, and location of the pre-bid conference). All bid opportunities are required to be published for a minimum of ten (10) calendar days between the first posting date and the date set for receipt and opening of bids. During the advertisement period, prospective bidders may only contact the purchasing agency for inquiries and clarifications in accordance with the solicitation requirements. Inquiries and responses shall be made uniformly available to all potential bidders and, if required, the procurement officer shall issue an addendum to the IFB that details any changes to the IFB. Addenda are typically used to communicate material changes to the IFB, correct minor defects, and provide information or clarification to potential bidders. If the purchasing agency must amend the IFB, it may need to consider the impact to the potential bidder and determine if additional time should be given for submission of bids. A pre-bid conference is conducted to explain the procurement requirements to a potential bidder and allow a potential bidder to ask questions. In accordance with HRS 103D-303.5, a pre-bid conference is required for all construction projects with a total estimated contract value of $500,000 or more and design-build projects with an estimated value of $100,000 or greater. IFBs for goods and services and construction below the dollar thresholds, may include a pre-bid conference. Such events shall be specified in the IFB, including date, time and location of the event. Construction projects and design-build project within the dollar thresholds, shall allow for a minimum of fifteen (15) calendar days between the date of the pre-bid conference and the date set for receipt of bids. This gives the purchasing officer time to make any required changes to the IFB, if needed, and provide the contractors adequate time to incorporate information learned at the conference into their bids. Pre-bid conferences for non-construction procurements are optional. Upon receipt by the purchasing agency, bid documents shall be date and time stamped but not opened. Bids shall be stored in a secure place until the time and date set for bid opening. At the time, date and place designated in the IFB for bid opening, the Procurement Officer and at least one witness shall publicly open all bids received. The names of the bidders and the amounts of their bids shall be read aloud and made available to the persons present. This information should be recorded at the time of opening in a bid tabulation or bid abstract. The name and address of the required witnesses shall also be documented. Bids are publicly available for IFBs conducted on an eProcurement system, upon the date and time of closing. The purchasing agency must inspect all bids to ensure they are signed by the bidder, verify and secure any required bid bond and remove any documents designated by the bidder to be confidential. All other documents shall be available for public inspection at the time of bid opening. Any bids that arrive after the official due date and time are considered late and shall be returned unopened to the bidder. For IFBs conducted in an eProcurement system bid information is publicly available online at the due date and time set forth in the IFB. Users must establish a free account with the State eProcurement system in order to view offers and abstracts. A bidder may correct a mistake in a bid prior to the time of opening by giving written notice to the purchasing agency of intent to withdraw the bid for modification or to withdraw the bid completely. Changes in a bid after opening are acceptable only if the change is made to correct a minor error that does not affect price, quantity, quality, delivery, or contractual conditions. In case of a mathematical error in extension of price, unit price shall govern. After bid opening, award is not automatic and the initial information obtained during the bid opening results in only an apparent low bidder. The apparent low bidder may or may not be awarded the contract. Bid award shall be made to the lowest responsible and responsive bidder whose bid meets the requirements and criteria set forth in the IFB. As such, after the bids are opened they must be evaluated to determine compliance with all IFB requirements, specifications and ability of the bidders to perform the contract. The Procurement Officer responsible for the procurement will examine the bid for compliance with all mandatory requirements and substantial conformity with the requirements contained in the IFB. After all applicable preferences are considered, bids are then evaluated to determine which bid offers the lowest cost to the state in accordance with the IFB. See discussion below on determining fair and reasonable prices via cost and/or price analysis. Other bidders had reasonable opportunity to respond or there is not adequate time for a re-solicitation. If any of these conditions are not true, the bid may be rejected and either a new solicitation may be conducted, the procurement may be canceled, or the goods, services and construction are procured using an alternate procurement method. A written record of a low tie bid, and its resolution, must be maintained with the procurement file. Use of this method to resolve the tie may not be allowable in contracts utilizing federal funds. The procurement officer must review federal requirements to determine if the tie bid resolution process may be used. A contract may only be awarded to a responsive and responsible bidder. A responsive bid is one that complies with the solicitation in all acceptability and material respects and contains no material defects. A material defect is one that affects price, quality, quantity, or delivery terms. Material deficiencies affecting responsiveness may not be corrected. the bid is submitted without pricing or with conditional pricing. Responsibility relates to the capability of the vendor to actually perform the work or provide the items the state is seeking. Responsibility may include a vendor’s ability to secure bonding, obtain insurance, or hire sufficient staff. Matters of responsibility may sometimes be addressed or corrected before contract award. Responsibility determinations require due diligence on the part of the Procurement Officer. If the lowest responsive bidder is believed to be non-responsible, it is highly recommended to work with the agency’s attorney general (AG) or corporation counsel (COR) to determine the best means of moving forward. Note: There is a wide body of judicial rulings that further define and refine the limits of responsiveness and responsibility. Therefore, when faced with a matter of either responsiveness or responsibility during your bid evaluation, SPO highly suggests you coordinate with your AG or COR to ensure your interpretation and any resulting determination comports with the most recent judicial rulings on these matters. The multi-step competitive sealed bidding method of procurement, is a combination of the competitive sealed proposals process (Phase 1) and the sealed bidding process (Phase 2). This method is desirable to use when it is determined that award to the lowest responsive, responsible bidder is desired, but it is not practical to initially prepare a definitive purchase description which will be suitable to permit an award based on price. The multi-step competitive sealed bidding method allows the purchasing agency to; (Phase 1) evaluate technical proposals, rank bidders, perform discussions, and allow revised priced proposals, if necessary; and (Phase 2) to identify the lowest, responsive and responsible bidder. In this process, priced bids may be submitted in a separately sealed envelope along with the technical proposals, or alternatively, the purchasing agency may instruct that priced bids be submitted after technical proposals have been submitted, evaluated and discussions are completed. Regardless of the approach, the priced bids are only considered in step two and only for those bidders whose unpriced technical proposals are found acceptable in step one. Unless price proposals were submitted during Phase 1, notification of the due date and time for priced proposals should be issued only to offerors deemed acceptable in Phase 1. If a separate submittal of the priced bid is required in Phase 2, the purchasing agency must provide all bidders whose unpriced technical proposals are found acceptable in Phase 1 an opportunity to submit their priced bid. 1. ⇧ Solicitations posted on an eProcurement system satisfy this public notice requirement. Advertisement through a public notice is intended to maximize competition.